This is a clever and colourful production that marries Mozart’s Magic Flute with Bavarian history, resulting in an interesting and entertaining three hours, one which while not supplanting traditional productions of the opera, is an interesting alternative, especially when done as well as this. 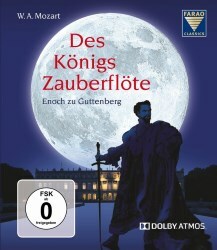 In this performance of the Magic Flute Enoch zu Guttenberg has harked back to the mid nineteenth century when wealthy and aristocratic families would put on amateur performances of great German theatrical works, with the production here beginning with the reminiscences of the old Papageno. It begins with a preamble where we see the preparations for the production take place with King Ludwig II being shown the lighting effects, whilst an elderly Papageno is remembering in particular a time when the local royalty took their places in the opera, when amongst the cast was Ludwig II himself as Sarastro and the Emperor Franz Joseph as Tamino (there is no evidence for this event having happened in reality). The role of Papageno is a duel one, you have the old man, played by the actor Gerd Anthoff, involved with, yet aloof from the action, though making comments and corrections as the action unfolds, whilst Jochen Kupfer sings the role of the younger Papageno in the opera. The production has a grandeur that far outweighs the provincial feel of the performance, this is mainly down to Enoch zu Guttenberg, who not only conducts the opera, but who also conceived the idea behind the concept as well as directing the whole production. Indeed the KlangVerwaltung Orchestra was formed from surrounding professional orchestras to bring Enoch zu Guttenberg’s ideas to fruition, the result being a wonderful orchestral sound. This is backed up by the splendid singing of the Neubeuern Choral Society, founded once again by Enoch zu Guttenberg to further the musical life of the area, and although more amateur in status, they have a professional sound and have appeared on a number of recordings. The soloists might not be household names, well at least not to me, but they all give spirited and enjoyable performances, with Antje Bitterlich bringing off the Queen of the Night’s famous aria with aplomb, whilst Jochen Kupfer brings just the right amount of humour to his performance, and Martin Petzold in full military uniform pirouetting around the stage in the guise of Monostatos/Otto Fürst Bismark is a sight to behold. There is also a telling involvement of three soloists from the Tölzer Knabenchors, indeed all the soloists add significantly to this very fine production. The disc includes an extra, a short introduction by Gerd Anthoff, in which he walks around Ludwig II’s palace at Herrenchiemsee whilst setting the ideas of Enoch zu Guttenberg in historical context before going on to place the performance in this context. As already stated this is a clever and colourful production, which is well performed, whist the costumes are a mix of nineteenth and eighteenth century and fully appropriate, it is well recorded with the audio and visual aspects of the production being very good indeed. The additional text might put some people off, but this does not interfere with the opera itself as it only occurs during natural breaks in the opera. An enjoyable production, one that tries to place the opera in a particular historical period, and achieves its goal, a very entertaining romp.